Cut 275g Cornish pollack fillet (or haddock, or any firm, white fish) into 6-8 short, wide rectangular fingers. Dust evenly in 25g seasoned plain flour; dip into 1 lightly beaten large egg; then roll in 50g Cooks’ Ingredients Lemon & Pepper Crust to coat. Warm 1 tbsp rapeseed or vegetable oil in a large frying pan over a medium heat. Cook the fish fingers for 3-4 minutes on each side, until golden. Meanwhile, mix 4 tbsp half-fat mayonnaise with 2 tbsp finely chopped mixed herbs (eg, basil, parsley and mint) and season. 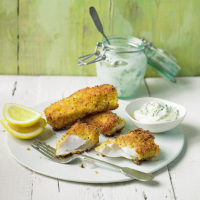 Serve the fish fingers with lemon wedges and the herby mayo in its own dish, with peas on the side.